Thanks, everyone, for rocking my sketch challenge this week. I am delighted that you enjoyed the sketch and it was great to see your creativity on full display. With so many fabulous entries, it's always difficult to chose our winners but let's see what caught the eyes of our design team for A Cut Above. 1. 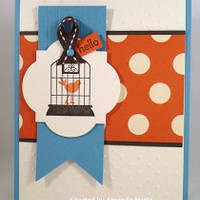 Ann's Choice: The gorgeous color palette of Amy's card drew me in right away! Add texture and an awesome bow, and you have the recipe for A Cut Above. Congrats, Amy! 2. Dawn's Choice: This fabulous fall thank you card is so clean and crisp! I LOVE that acorn and leaf! Congrats, Lori! 3. Amy's choice: Betty's gorgeous Christmas card really stood out to me - I love the shimmer and sparkle of the trees against the elegant background layers with the stitching. Congrats Betty! 4. Jen's Choice: I really liked that Jen took the sketch and turned it, and using a stamped image to create the panel, AWESOME! Great job, Jen! 5. 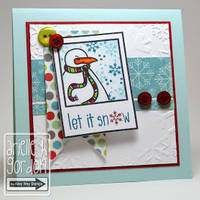 LeAnne's Choice: Arielle's sweet little snowman sitting in his snowy field makes me smile! I love the brightly colored background as well! Congrats, Arielle, on being my Cut Above! 6. 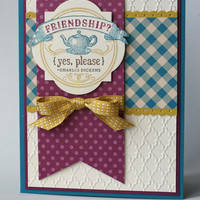 Anne Marie's Choice: I just loved Amanda's card as soon as I saw it. The playful polka dots and a rockin' color combo are such a fabulous match! Congrats to you Amanda! 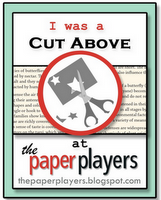 All of the CUT ABOVE winners can wear proudly display the badge below on their blogs. Congratulations to all of you! 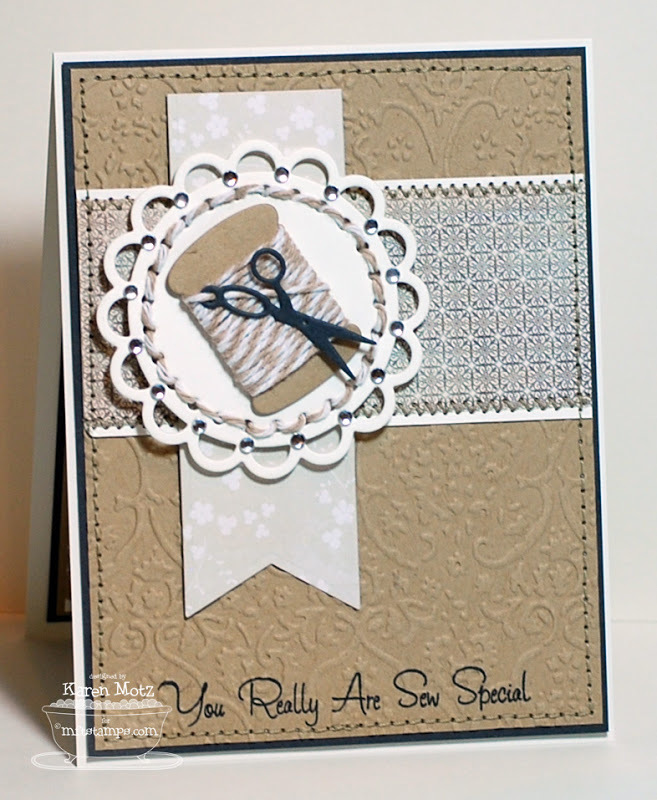 There were so many fabulous creations this week but the incredible details on Karen's sew special card kept bringing me back. The darling spool of thread and scissors are to "die" for and with three different kinds of stitching she had this sketch all sewn up! Congratulations Karen, you're my choice for this week's Headliner! 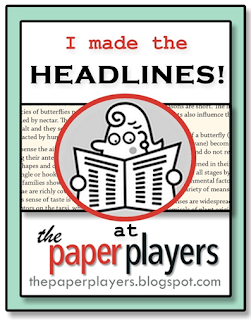 We hope that you will wear your badge proudly on your blog! Thanks for stopping by today. 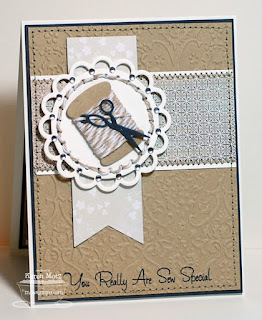 Be sure to visit us tomorrow for a Theme Challenge from the always-amazing-Ann! Wow! Such gorgeous cards here! I loved that sketch Nance, am filing away for future use my friend! Karen's card is really fantastic! Congrats to all the winners this week! 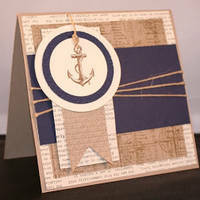 Thanks so much, Jen, for including my card as a Cut Above! All cards are so very pretty. Congratulations to the winners. Wow, I'm so grateful! I don't know how you all are able to choose when there are so many gorgeous cards each challenge! Thank you for the fun weekly challenges! Wow! 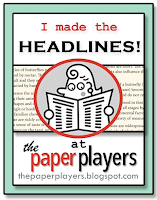 All the picks are awesome, and the "Headliner" is fabulous! Congrats to all of you. Well deserved! Karen's card is just beautiful! Nance- thanks for a super sketch to work with! 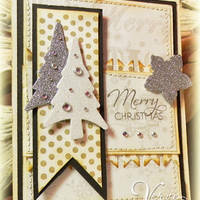 Thanks to Anne Marie for choosing my card as her Cut Above choice! 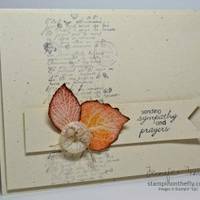 I'm honored to be included among all these wonderful stampers!